Acerola (Burning Shadows, 112/147) debuted in the Burning Shadows expansion set. This Supporter card gave us something we hadn’t had for a long time – a way to pick your Pokemon up off the board. Any damage counters on that Pokemon fall off, and, because you put it back into your hand, you have the opportunity to play it right back down again. Man, good thing we didn’t have this card back a year ago in December when we were bashing each others heads in with Yveltal EX. Pair that with VS Seeker, matches might go on for hours! Acerola has seen quite a bit of use since its inception. At Worlds, the first tournament it was legal in, five out of the top eight decks played at least one of this card. The Zoroark GX Lycanroc GX deck that won Memphis this weekend carried one of these as well. 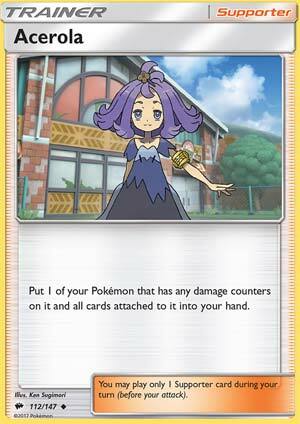 Acerola has seen the most use in big Basic decks that can do significant damage for only a single attachment. The Theorymon is that you will hit your opponent for a considerable amount of damage, and then it doesn’t matter if they smack you back, because unless they OHKO you, you can use Acerola to pick up your attacker, advance another one, attach the energy from the Pokemon you picked up, and then KO the active Pokemon you damaged in the previous turn. This strategy has defined the meta for many decks, and many top decks have employed Acerola to help them succeed at the highest levels. While not for use in every deck, Acerola has proven invaluable in single attachment attacker decks. It has also seen some use in allowing you to pick up Pokemon whose ability is activated when played from the hand to the bench (i.e. Tapu Lele GX). In my own decks, I know I need to consider finding a card slot for this card more often. I frequently squeeze it out in my deck builds, and I think that could be a mistake in many cases. This is definitely a card I should tech in more than I currently do. Acerola may not have as much showtime when this Supporter card came out on SM Burning Shadows, but I don’t deny Acerola’s potential. She bounces one of your Pokemon and all cards attached to it to your hand. As I said about bounce cards, this is very useful for getting a damaged Pokemon away from play while denying your opponent from taking prize cards and you can use coming-into-play abilities again by putting the Pokémon on the bench. The tricky requirement would be that a Pokémon has to be damaged in order to be bounced, and that wouldn’t work very well on Pokemon with coming-into-play abilities since they are unharmed. Damage mover might work due to transferring damage taken from one Pokemon to another Pokemon, making the requirement manageable. This card took 2nd place on the top ten Burning Shadows cards, and I lowballed it. Now, this is one of the best alternative bounce options besides Super Scoop Up. Other Supporters in Expanded such as Cassius, AZ, and Scoop Up Cyclone may give Acerola competition, but is still a good option nonetheless. Notes: On some occasions I may have lowballed or overrated on one card because I first thought to be amazing or unplayable, thus being uncertain on myself. However, if I give myself more time, I can learn about the potential of such cards rather than concluding too soon. Prize denial, especially pick up cards, is always a very crucial thing in PTCG. The ability to snuff out 2 shots or missed one shots, pick up a Pokémon and simply put them back to the field is a luxury that most decks simply couldn’t resist. And as AZ and Scoop Up Cyclone left the format all those years ago, those same people will rejoice that a similar card arrives to fill in that gap – Acerola! Just like AZ, it is a Supporter card, so it’s gonna be worth your usage in a turn, since you’re not drawing any cards or redirecting any opposing Pokémon in your next turn. And like AZ, it picks up a Pokémon in your field, denying prizes and “heals” a Pokémon by removing it from the field. But unlike AZ, it has differences. It can only be used by Pokémon with damage counters, but unlike AZ which only picks up the Pokémon in the highest visible line of sight and discards the cards underneath it, Acerola picks up all of them. This creates a unique dynamic in which how different are AZ and Acerola when played. Whilas AZ is designed for aggressive plays in which you have lots of resources in your hand and you can afford to spend something, Acerola is designed for slower plays, in which you can’t simply afford any unnecessary cards just to get a certain combo going. A huge example is shown clearly in Stage 2 decks, let’s say Gardevoir-GX. If Acerola is an exact carbon copy of AZ, then I also need to have a Ralts on the bench, a Rare Candy and a Super Rod plus some energy returning cards hand OR a Kirlia in the bench and a Rescue Stretcher just to get another fresh Gardevoir. I can’t even prepare another Gardevoir-GX, which is huge in many matches On decks that may have about 12-15 cards total in the field (which is about a quarter of the deck content itself) and needs about 20 cards just for it to fully setup, using AZ simply won’t cut it in the current format. But if I’m playing a Mega Gardevoir-EX deck, then I can just AZ my lead Mega Gardevoir and I wouldn’t give a finger about what’ll happen because Mega decks are a bit less resource heavy and can just recycle them without any big troubles. But if Acerola is printed as it is now, then I can just return the wounded Ralts, Kirlia, Gardevoir-GX and all the energy on there and just evolve other Ralts and Kirlias in the bench as well as attaching and accelerating energy when possible, even the point of promoting a new one and attacking again, giving a second life in matchups. I cannot stress enough about how powerful is Acerola in the current meta to just recover resources, and thus game momentum to be able to punish my opponents for not one shotting my Pokemon in a turn. It’s a great card that you should always consider as a utility Supporter in all decks. Our collective pick for the ninth best card of 2017 is Acerola (SM: Burning Shadows 112/147, 142/147), who was our number two pick when we did a countdown for her expansion’s best cards. She is a Trainer-Supporter that allows you to bounce one of your injured Pokémon, including all cards attached to it, to your hand… which half explains why she’s on the list; she can function as healing, allow you to reuse coming-into-play effects, redistribute resources that were used by other Pokémon, and even deal with something stranded in the Active position. Indeed, most of what is left is explaining why she didn’t rank higher in our countdown. To begin with, SM: Burning Shadows didn’t become legal until August; while it was in time for the 2016-2017 World Championship, that still means she missed nearly 2/3’s of the year. Next is competition; you’ve got cards that compete with Acerola both directly and indirectly. There are other bounce cards, plus a deck can only contain so many Supporters and still prove competitive. The rest is the nature of the format; if something isn’t outright immune to damage, it has to worry about OHKO’s. Gardevoir-GX, Golisopod-GX, Wailord-EX… these are all Pokémon that can take major advantage of Acerola, but the Bench-sitter that rarely takes damage, or the glass cannon that won’t survive taking damage can’t, and they are major parts of the metagame in both the Expanded and Standard Formats. In the end, Acerola earned 24 voting points, three more than yesterday’s 10th place finisher, Garbodor (SM: Guardians Rising 51/145), and four less than tomorrow’s eighth place pick. Though this is a top 10 list, reviewers were allowed to submit up to a top 15 list; Acerola made two of the actual top 10 lists and one of the top 15’s. The one reviewer who didn’t include her at all was me… which seems odd, given how I praised her the last time we looked at her. Since then, I’ve had to admit she didn’t work quite as well as I’d hoped for general play, but her role in decks I underestimated (like Gardevoir-GX) still lead to a good performance. I’ll add a Theme Deck score this time, as a single Acerola is included in “Rock Steady”. #9 Acerola – One of the most useful Supporters to come out in the Sun&Moon era, Acerola offers players the ability to recuperate their resources while denying KOs. It’s no surprise to see it make the cut on this list, and I’d imagine that the ability to retrieve any Pokemon with damage on them will remain very useful for the time being. There’s at least no real reason to think that Acerola will fall out of popularity any time soon.